STC-6 promises to "punch above its weight"
Sontronics claims that the STC-6's sound quality belies its low price. 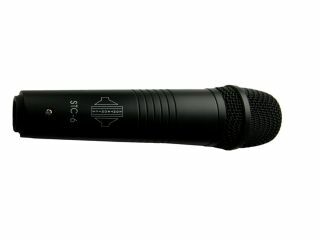 The STC-6 is a new handheld condenser mic from Sontronics. Building on the success of the STC-5, this sports a redesigned body and offers additional features. The mic´s body is said to be robust and ergonomic and has grooves that aid grip. Recessed switches control the 0dB/-10dB pad and linear/75Hz high-pass filter. Sitting inside the STC-6 you´ll find a cardioid capsule mounted on a shockmount cradle. This houses a multi-point electrode post that we´re told increases the signal integrity and reduces the potential for corrosion. Shipping in an aluminium flightcase, the STC-6 will be available late in March 2008 priced at $199/€159/£95. You can find out more on the Sontronics website.